In a vaguely frail but determined British accent, Jane asks us to sit cross-legged on the floor in front of her. We abide like a bunch of praise hungry school kids. Over the next hour, we listen intently as the good doctor talks about her incredible journey from secretary to scientist, the delicate balance of man and environment, her meetings with world leaders, the Jane Goodall Institute, and her travel buddy of the past twenty years – Mr H (see fact 37). As we pass the toy chimp around the room, she points out Mr H’s anatomically incorrect tail feature. (No, they don’t have them.) She’s funny but always the scientist. 1. Jane was born in London on April 3, 1934. 2. Jane’s full name is Valerie Jane Morris-Goodall. 3. Jane spends a lot of time on planes. She travels approximately 300 days each year. 4. Jane hasn’t slept in the same bed for three consecutive weeks for over 20 years. 7. Jane loves watching funny animal videos on You Tube. Her favourite is ‘coyote plays with cat’. 8. Jane’s favourite drink is whiskey. After a long day (which is most days), she raises a “tot” to all her beloved primates who have come and gone, as well as her to her mother, who encouraged her ambitions and love of animals. 10. 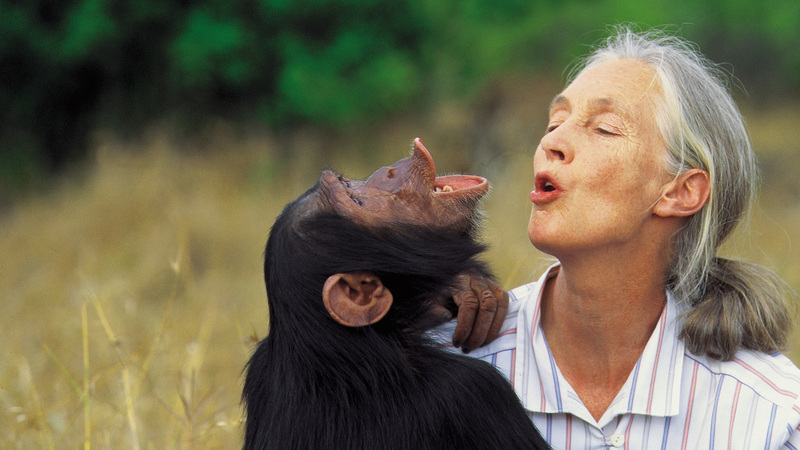 Jane’s work with the Gombe chimps in Tanzania changed the way we think about animal behaviour. 11. Jane is referred to as The Woman Who Redefined Man in Dale Peterson’s 2006 biography. 12. Jane and her team were asked to advise on chimp behaviours during the filming War Of Planet Of The Apes. 15. Jane has written 26 books and recorded more than 20 films for cinema and TV. Her work as an ethologist is unparalleled. 16. During her 5o years in the Gombe jungle of Tanzania, Jane studied and documented the social behaviour and family roles of the chimpanzees, living between them. 17. Jane is fascinated by the idea of a yet to be discovered ape species living in the wild. A self-described romantic, she has read many accounts of Bigfoot sightings and thinks the big fury myth is a real possibility. 19. Jane was first introduced to chimpanzees when her father presented her with a toy chimpanzee when she was one year old. Jane named it Jubilee and today he still has a place on her dresser. 20. As a child, Jane loved all books about Africa, especially Edgar Rice Burrough’s Tarzan series. Although she was always disappointed in his love interest, professing she would made a better romantic Jane match. 21. As a young child, Jane once sat for five hours in her family’s chicken coop to wait for a hen to lay an egg. Her family eventually called the police to report her missing. 22. Jane worked for years as a secretary, waitress and filmmaker’s assistant after graduating high school. 23. Jane first travelled to Africa when she was 23 to visit a friend in Kenya. It was on this trip she the met famous anthropologist Dr Louis S.B. Leakey who hired her as his assistant. 24. 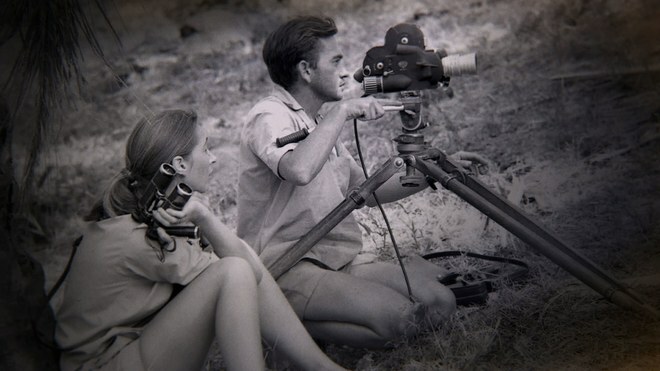 Jane’s mother joined her on her first journey to Tanzania in 1960 after the British government deemed it inappropriate for women to travel alone the region. 25. Jane’s two revolutionary observations about chimpanzees on her Tanzania trips included: 1) that they used tools – a behaviour previously attributed to only humans. 2) chimpanzees were not vegetarian. 26. Jane’s discoveries led to National Geographic sending photographer Hugo van Lawick to document her observations with chimpanzees in Tanzania. 27. Jane married Hugo van Lawick in 1964. 28. Jane has one child, a son named Hugo Eric Louis. He lives in Tanzania next to Jane’s house on the shore of the Indian Ocean. 29. Jane was one of the first students to be accepted by Cambridge University to undertake a PhD without a college degree. 30. Jane says that studying at Cambridge taught her to think in a “scientific and more logical way”. It gave her the tools to “stand up to people”. 31. Jane has received more than 50 honorary degrees. 32. Jane’s greatest fear is losing her mind. 33. Despite being recognised as the world’s foremost expert in chimpanzees, Jane’s work has not escaped controversy. Many scientists disapproved of her naming chimpanzees rather than assigning them numbers. 34. Jane has many celebrity friends and admirers. Fans include, Justin Timberlake, Cameron Diaz, Angelina Jolie and fellow Jane, Ms Fonda. 35. Jane has married twice. Her second husband, Derek Bryceson died of cancer after only 6 years of being married. 36. Jane shares the same birthday as her younger sister Judy, born on the same day fours years after Jane. 37. Jane and Mr H go back 20 years. He came into her life in 1996 as a birthday gift from a good friend named Gary Haun. Gary had been a US marine who had lost his eyesight in a helicopter crash as a young man in his twenties. But he did not allow this setback to prevent him from achieving his goals and went on to become a successful magician. 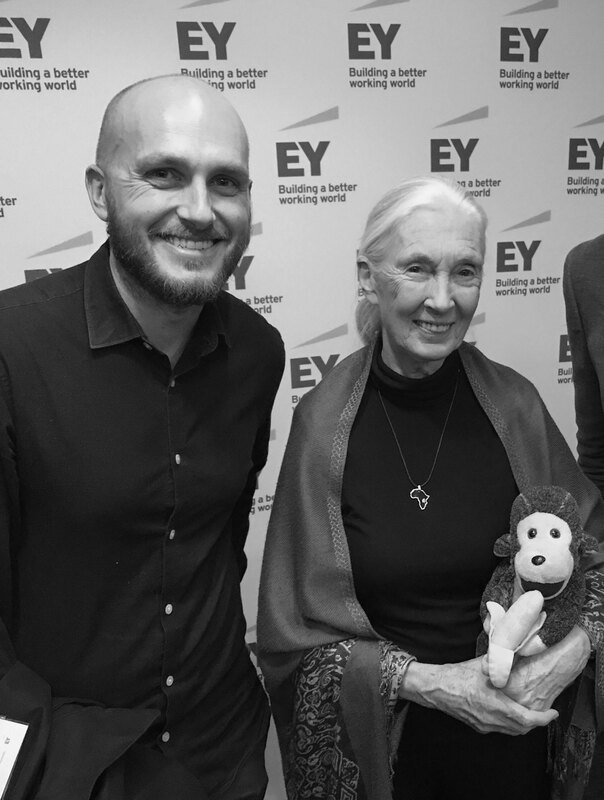 Inspired by Gary’s perseverance, Jane turned her birthday present into a motivational mascot for the Jane Goodall Institute. 38. 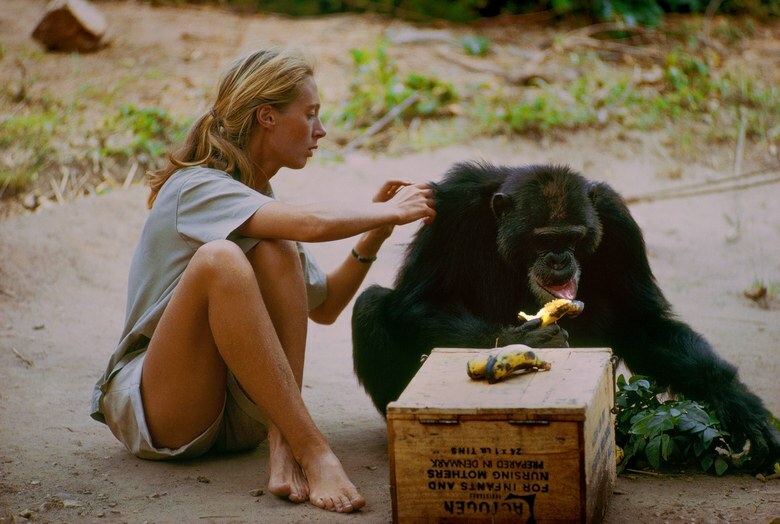 While observing chimps in Gombe, Jane would wear low-top canvas sneakers although mostly she went barefoot. 39. David Greybeard is the name of the first chimpanzee to trust Jane enough to approach her. He was also one of the chimpanzees Jane first observed making and using a tool to “fish” for termites. 40. In the early years, other (male) scientists didn’t accept any of Jane’s findings. Dismissing her as simply a “Geographic cover girl”. 42. While studying chimps in Gombe, Jane would often sit out in the wild for 16 hours a day without food or water. 43. Jane’s father was a race car driver. 44. 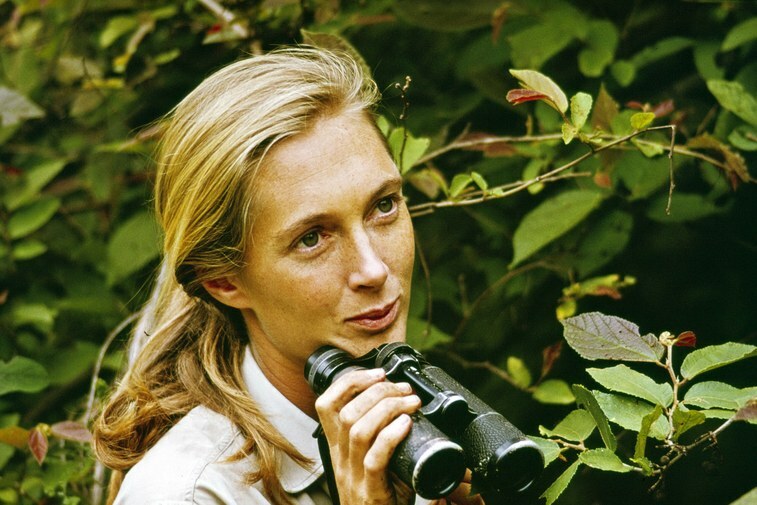 Jane founded the Jane Goodall Institute in 1977 after realising that local communities are the heart of conservation. Today the JGI is based in more than 20 countries and is dedicated to improving the lives of people, animals and the environment through nine programs that build on each other and bring the power of community-centered conservation to life. 46. Jane founded Roots and Shoots in 1991, a worldwide foundation that empowers young people to become compassionate and environmentally conscious leaders. 47. Jane has a medial condition called prosopagnosia (face blindess), where she can see eyes, lips and other facial features, yet cannot remember the whole face. The condition affects one in 50 people, including Brad Pitt. 48. Jane’s influence led to the chimp enclosure being changed at London Zoo. 49. Jane credits her mother Vanne and her first dog Rusty for giving her the inspiration and love that helped shape and inform who she is today. 50. Jane’s earliest memory is when she was two and a dragonfly flew near her and a man knocked it to the ground and trod on it. She remembers crying. 52. Jane finds online self-promotion “strange” and openly admits to having a team manage her social media accounts. 53. Jane travels pretty light and does not have a lot of possessions. She mostly lives out of her one-piece carry on bag. 54. Jane is a vegetarian and has been for more than 50 years. 55. Jane is a Dame Commander of the Order of the British Empire, a UN Ambassador for Peace, and for a brief period, during her marriage to Baron Hugo van Lawick, she was also Baroness Jane van Lawick-Goodall. 57. Jane once appeared as herself in an episode of the animated series Wild Thornberrys, “The Trouble With Darwin”. 59. Jane Fonda attended Jane Goodall’s 80th birthday party. 60. Jane’s first husband, Hugo, proposed to her via telegram. 61. In 2014, Jane and David Attenborough joined forces and called upon the Australian government to create a new national park in Victoria to save the endangered Leadbeater’s possum. 62. Jane believes we (humans) need to do more to get onto green energy and stop pandering to fossil fuel companies. “We’ve got sun, we’ve got wind, we’ve got currents, but we’re adding to the greenhouse gases, recklessly burning fossil fuels, burning forests and (fueling) our desire to eat more and more meat—which is raising millions of animals in these terrible factory farms. 63. Apart from hotels, Jane has three places she can call home – one in Gombe Stream (now a historical building owned by the Tanzania Park Services), one on the ocean in Dar es Salaam, Tanzania, and another, her families home where she grew up in Britain. 64. While eating at a restaurant one night, Jane once found a bug in her soup. Instead of sending it back to the kitchen, she gently retrieved the little bug and set it on a napkin to dry out its wings. She finished her soup and the bug made a full recovery. 65. Jane still goes back to Gombe twice a year. 66. Jane has 1.2 million pages dedicated to her online, including one for those who want tips on how to ‘dress up like Jane’ for Halloween. 67. Jane likes to fall asleep listening to audio books. 68. Jane was in New York during the September 11 attack. 70. Jane’s first attempts to closely observe chimps failed after only getting a couple of hundred meters away before they fled. She eventually established a nonthreatening pattern of observation, appearing at the same time every morning on the high ground near a feeding area along the Kakombe Valley. 71. The first dedicated documentary about Jane, Ms Goodall and Wild Chimpanzees, was aired in 1965 on American television as was narrated by Orson Welles. 72. Jane almost died in 2007 when a rock dislodged and came down on top of her while climbing in Gombe. 73. If Jane could go anywhere back in time it would be Africa in the 17th century, when fish filled the lakes and millions of birds and animals covered the plains. 74. Jane says her greatest achievement is writing In The Shadow Of Man – a book attributed to changing the way we view animals. 75. If Jane could bring anything extinct back to life it would be our ape-like human ancestor. 76. Jane’s like to start the day with a banana and a cup of coffee. 77. Jane discovered chimps have a complex social system, complete with ritualized behaviors and primitive but discernible communication methods, including a primitive “language” system containing more than 20 individual sounds. She is credited with making the first recorded observations of chimpanzees eating meat and using and making tools. 78. Meeting Jane Goodall often results in tears. The day we met her caused more than a few glassy eyes. 80. In 2004 Jane was made a Dame of the British Empire. 81. On the rare occasion she gets a day off, Jane likes to spend the day walking alone in the forest. 84. Jane is amazing. Let her know here by signing her birthday card. Or better still supporting JGI.